It was the RYA South West Zone who walked away basking in the winners glory as day two of the 2013 RYA Eric Twiname Championships came to a close on Rutland Water today (Sunday 12 May). Having endured fickle winds, strong gusts and driving rain on day one of the regatta yesterday, the concluding day of the championships brought with it far more favourable conditions for the 268 competitors at the event, with spells of sunshine and an average 12-14 knots. As a result the days full complement of three races took place allowing for some swapping of places at the top of the fleets and the RYA South West Zone to emerge as the 2013 RYA Eric Twiname Champions. Whilst the RYA South West clinched the prestigious Eric Twiname Shield, the RYA South Zone won the Eric Twiname Dinghy Trophy, awarded to the Zone performing best from the top two dinghy classes out of the three, while the South East Zone clinched the Eric Twiname Windsurfing Trophy out of the grasp of last year's winner the North Zone, awarded to the Zone scoring best from two of the four windsurfing classes. In the RS Feva XL class South Zone sailors Edward Norbury and Charlie Hutchings delivered a consistent set of results on the final day of the championships with 2-1-3, catapulting them above the South West Zone's overnight leaders Alaric Bates and Matt Walker-Morecroft to take event honours by a single point. Michael Dennis and Milo Gordon rounded off their regatta in third place taking another podium spot for the South West and therefore sealing the overall top spot for South West in the RS Feva XL class. The Topper fleet was flipped upside down today with the sailors who occupied first and second spots overnight slipping outside the top three. North Zone sailor James Tulley, who was lying eighth at the halfway stage of the regatta, had a fantastic day out on the water climbing back up the leaderboard with 7-3-2 to pinch event victory by six points. Jonathon Wilson from the South West also leapfrogged from 10th to second after 25-2-9 for today's efforts. South Zone sailor Imogen Kemp managed to hold onto her podium spot from day one to finish third overall and top girl in the Topper class. The North Zone was awarded the prize for the top Topper Zone. East Zone's Hannah Tucker wrapped up event honours in the Optimist fleet notching up consistent results from across the six races completed, including three seconds to give her an impressive 11 point lead over second place Callum Cook from Scotland. South East Zone's overnight leader James Hammett, who although posted two bullets in his final two races of the day, slipped two places to finish his weekend in third after a frustrating 29th and 28th in race one and four. The top Optimist Zone was awarded to the South. In the windsurfing fleet Benjamin Temme from the South East Zone continued his dominance from day one posting two bullets and a third to cement his position at the top of the 4.5m leaderboard to clinch event victory. In the 5.8m rig, Ben Tweedle who was crowned 2012 champion in the 4.5m rig at last year's event continued his fine form at Rutland taking Championships honours with a scorecard of six from his six races completed. The overnight leaders in the larger 6.8m and 7.8m rigs also continued to govern with Scotland's Andrew Brown and East Zone Alexi Murphy clinching Championships titles in their respective fleets. The top RYA Zone in the 4.5m rig and 5.8m rig was the South East, Scotland clinched the 6.8 top Zone while the North retained the 7.8 overall Zone. 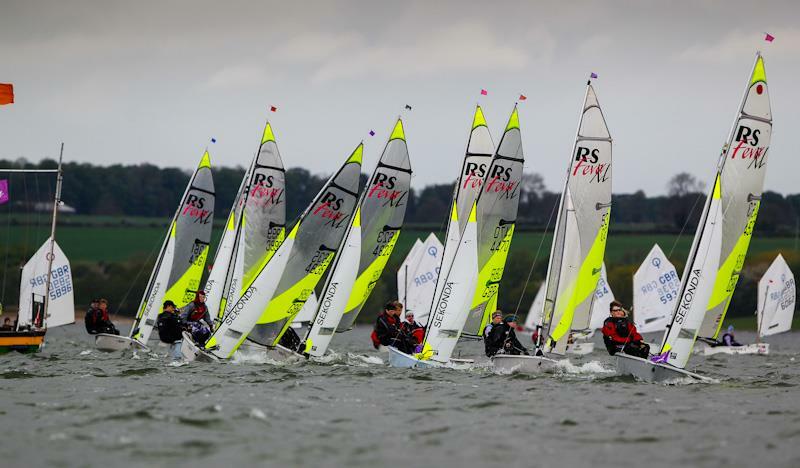 The second part of the selection process for the 2013 RYA Laser 4.7 National Junior squad is also taking place alongside the Championships, with results from Rutland used in conjunction with those from further indicator events later in the season. Jamie Calder from Loch Tummel SC took event honours adding an impressive three bullets to his two race wins which he secured on the opening day of the regatta. Duncan Truswell, RYA Youth Racing Manager, said: "The Championship this year has once again been an enormous success with the South West Zone walking away proud winners. I have been extremely impressed by the standard of sailing displayed across the RYA Junior classes this year, the sailors have obviously worked hard with their coaches over the winter as part of the RYA Zone and Home Country Squad programmes and its really pleasing to see how much progress has been made and how capable the sailors are. Once again Rutland Sailing Club fielded a massive team of volunteers and have made us all fantastically welcome from word go. I would like to express my gratitude on behalf of the RYA, the Trust and all the sailors who have benefitted. My thanks as well to the Eric Twiname Trust for supporting the regatta for the 27th consecutive year." Thanks to the long-standing and on-going support of the Eric Twiname Trust, the event is free to enter with all of the costs associated with the running of the regatta met by the RYA and the Trust.